Ishirō Honda’s 1954 film, Godzilla (ゴジラ), appeared in the wake of the horrific nuclear bombings of Hiroshima and Nagasaki — events in which over 100,000 persons were killed instantly, while tens of thousands more died later due to radiation poisoning and other bomb-related injuries. Against this backdrop, Honda’s film was issued as a kind of warning. Godzilla was a daikaiju (大怪獣), a “giant strange creature” released from the bowels of the sea by nuclear testing. Wreaking havoc on Tokyo and its environs, the monster is finally destroyed by scientists, who, at film’s end, come to confront the peril of modern technology. Its power, too, must be subdued, lest other daikaiju also appear. The social and political concern of the original Godzilla stands in stark contrast to the latest incarnation of the franchise. Helmed by the English director, Gareth Edwards, the new Godzilla takes a more intimate approach. Its protagonist is Ford Brody (Aaron Taylor-Johnson), a San Francisco-based explosives expert who longs for nothing more than a little R&R with his fetching wife, Elle (Elizabeth Olsen), and cute-as-a-button little boy, Sam (Carson Bolde). Yet, when his father, Joe (a manic Bryan Cranston), is arrested in Tokyo, Ford is forced to head overseas and, hopefully, to resolve the situation. Of course, it’s hardly that simple. A decade and a half earlier, a Japanese nuclear power plant exploded in a freak accident. Joe had been its supervisor, and he lost his wife (and Ford’s mother) in the disaster. Joe remains convinced that the tragedy’s cause did not lie with normal seismic activity but, rather, with some unknown phenomenon. Thus he continues to research the site of the accident and, in the process, to run afoul of the authorities. Arriving in Tokyo, Ford sympathizes with his father, but wants him to be reasonable: why, after all these years, can’t the old man just let it go? But Joe is incorrigible, and soon father and son find themselves back in the quarantine zone. What they discover there is astonishing: the site is no longer radioactive, and scientists are monitoring the activity of an enormous creature, a so-called Massive Unidentified Terrestrial Organism (MUTO). The MUTO, a gigantic, winged, spider-like monster, whose face vaguely recalls the Predator, soon escapes from confinement and heads out across the Pacific Ocean. Its task, as we eventually learn, is to mate with a companion MUTO, which has emerged from the Nevada desert. This puts it on a direct path for — you guessed it! — San Francisco. Now, at this point, one might well be wondering: isn’t this movie about Godzilla? And the answer is: sort of. In truth, the narrative thrust of the film belongs to Ford, who, after Joe is killed by the MUTO, desperately tries to make it back to San Francisco, where he can protect his family and, with the help of his military confreres, save the city and the rest of humanity. Yet, as the plot unfolds, and as the MUTO’s rampaging continues, it becomes clear that human beings will not be able to resist the MUTO. As the chief scientist notes, “The arrogance of men is thinking nature is in their control and not the other way around.” Only another beast, then, can stop the MUTO, and that beast is — you guessed it again! — Godzilla. 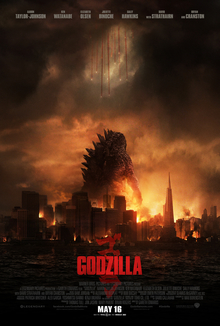 Needless to say, when Godzilla finally shows up, fighting ensues, skyscrapers topple, and people run around screaming. Edwards manages the spectacle with considerable skill, but one can’t help but wonder: what’s the point? The MUTO and Godzilla are essentially blind forces; they hardly pay any mind to the human beings around them. Moreover, just why Godzilla wants to liquidate the MUTO is equally baffling. Apparently, it’s all part of nature’s “power to restore balance,” but aren’t Godzilla and MUTO unnatural monsters, created by the nuclear energy fabricated by humans? Whatever. It really doesn’t matter, as the real goal of the film is to show stuff blowing up and, at last, to give us a shot of Ford embracing his wife and son. In the end, then, the interesting question is: why is this Godzilla so different than its celebrated forerunner? In other words, why is the politically-conscious message of the original Godzilla seemingly no longer of interest? A number of possibilities come to mind. The obvious answer is that, well over twenty years since the end of the Cold War, we no longer fear nuclear armageddon as we once did. Indeed, in the 2014 version of Godzilla, the dangers of atomic energy as such are largely ignored, apart from the fact that the MUTO likes to snack on nuclear warheads. Another possibility is that, in the era of smart phones and iPads, we are far more comfortable with technology than we used to be. The dire warnings of the first Godzilla seem strained, outdated. At the same time, however, the absence of a socio-political critique should not imply that, in 2014, all is well. Although the film does not show much gore, people do die by the thousands. Moreover, these people are rarely active participants in the action. On the contrary, they are innocent bystanders, “collateral damage” in the fight between agencies that are both unknowing and unknowable. Is it possible, then, that Edwards’ Godzilla is more bleak than Honda’s? The latter suggests human responsibility for the world’s ills and the ethical imperative to change; the former maintains that, in the face of cosmic pandemonium, the best we can do is hope to avoid destruction at the hands of an indifferent material universe. Tend to your family, Edwards implies, for calamity may strike at any time, and it does not discriminate between victims. Of course, there is some truth to this perspective. It serves to check human hubris and, perhaps, reminds us to appreciate the present moment — the smile of a loved one, the kindness of a stranger. But can it sustain the human spirit? Is the specter of a brutally disinterested cosmos enough to foster faith, hope, and love, not just in God, but in the very dignity of earthly life? Intriguingly, in one flitting scene, Edwards seems to suggest that the answer to these questions is no. As Ford and his fellow soldiers prepare to confront the MUTO, one of them opens a Bible and begins to pray. It is a prayer for God’s support in the field of battle, but it’s more than that: it’s a prayer that God might exist at all, that there might be some purpose in the purposeless surrounding them.